I’ve heard about Angel’s Envy every now and then over the past couple of months and its launch earlier this year seems to have been well received. It certainly is intriguing if only for the fact that the plan is to make a different expression each year. This has worked well for Old Forester’s Birthday Bourbons and I like the potential for an evolving product line. On top of that, it seems that this year’s expression has been finished in port casks — this is the kind of development and experimentation I like to see in American whiskey production. While it’s a familiar process across the Atlantic, sometimes it seems like the Bourbon Purists scare the experimental streak out of whiskey production over here, so even a modest level of experimentation like this is welcome. Here’s hoping it lives up to its promise. Unfortunately, all I have is a sample-sized bottle in front of me, so I can’t go into too much detail in this respect. However, from what I can tell from the image, the bottle avoids gratuitous nostalgia, but perhaps tries a little too hard to pull at the heart-strings of the whiskey-hipster set with that typeface. I appreciate the simplicity and flowing profile, so over all not too bad. On the nose, I get a solid ripe-grain scent integrated with dark cherry and a distant char. It’s forward, but solid to the nose, with some lingering alcohol wafting up more than I might usually like. Tasting it, the bold spicy/peppery character comes across immediately, beneath that there’s vanilla and caramel with some hint of that dark cherry note from the nose. The finish is very long and pleasantly spicy with some pine notes coming toward the end. 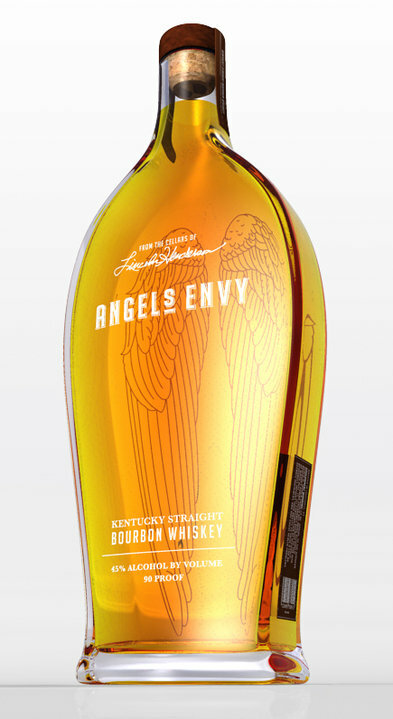 Maybe it was my focus on the port cask finishing, or the delicate bottle design, but I was expecting a much lighter style for Angel’s Envy. That said, I’m pleasantly surprised by its forward character and bold spiciness. It was hard to distinguish what came from the port casks, it came across with a unified, confident profile. I’m impressed, nice work. *Note: This review was based on samples sent to me by a representative of LDC. I assure you, this did not affect my review except prevent me from criticizing the bottle.